Hairdos aren't what they used to be. We're not dissing the styles of the day, we just know that people don't put as much work into topping off their styles as they did in the seventeen hundreds. Just look at this wig. It's tall, it's curly, and it would fit in perfectly in the dance halls of eighteenth-century Paris. While our hair might not be as over the top as wigs were in Versailles, we should probably be grateful. For a while there, wig making was a big money maker. The ladies of this era wore their hair more than a foot into the air. They were heavy, made of wool, and usually infested with vermin. Lucky for you, this chic wig is none of these things! People will serve up respect on a silver platter when you show up in this tall, curly wig. You'll love the dramatic jeweled do with curls cascading down the back of your neck. Whether you're courting in the halls of Versailles with Marie Antionette or you're hunting in the slums of London as an evil vampire countess, you're sure to make a grand entrance. 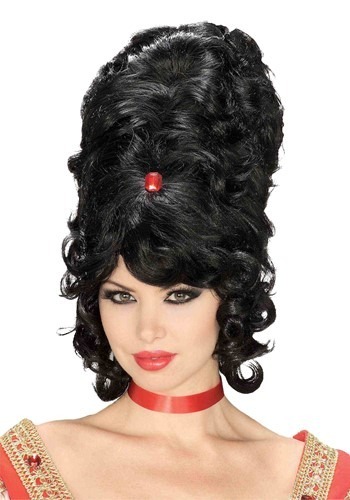 Pair it with our saloon girl or royal costume and you'll find this wig brings your outfit from pretty to showstopping!